So other then the scrap yard, has anyone been able to find the trailblazer interior for the 94-05 blazers? And also if there is anyone looking to get rid of a set in decent shape, I would be interested in hearing for how much. I've gone to a few scrap yard and kept updated on the online ones near my area that update they inventory online. And I don't know if they where made by order or if there were so many to so many locations. 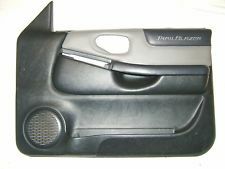 I have a set of the trailblazer front door panels, and a set of the diamond edition panels too. I WORK in a salvage yard, it's hard to come across any S series interiors that aren't ragged out... Only two main changes I want to make to my 04 4door's interior and I'll probably never find either in good shape... either good condition charcoal colored power & heated leather seats with matching leather seats for the rear, or a complete diamond edition interior. What colour? Where are you located and how much? Ill try get pics tonight. Look like the ones in the pic. I got $50 into them. In Franktown, work in Ottawa south. That's a few hours from me... I'm just east of London by about an hour. Is that 50 for the pair? Yes, the pair. Ill be in burlington march 24th for a suppliers open house. Could bring them with me. Didnt get to take pics. Spent a few hours at emerg last night for a bad cough. That sounds Good. do you know if your taking the 401 or the 403 yet? I would be willing to meet for them depending on the shape. I will be coming from north of Milton, Burlington is around an hour south of where I live. I recently sold the same Trailblazer driver and passenger door panels Logan has. Very nice, but I really like the all black Bravada panels I have now. As far as seats go... I am on that mission to this day still to find that elusive Diamond Edition Jimmy interior. I recently spotted GMC Jimmy Envoy seats in my local scrap yard. I passed as the color was not my taste. I currently have some Bravada heated black leather seats in. I put some seat covers on them cause they get too hot in the summer.... Need an AC seat conversion.